Silver Mountain Ski Resort doesn’t roll off every skiers roster – but that’s what makes it a cool ski spot for families. Silver is actually two mountains located in the Silver Valley region of Idaho’s northern Panhandle, in the quiet town of Kellogg off Interstate 90 in Shoshone County, an hour east of Spokane Washington. 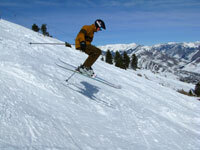 Silver is a quirky mid-sized ski mountain with a sizeable 1,600 acres of terrain and 2,200’ vertical. You start, and end, your ski day on Silver Mountain’s transport gondola from the base village, a long scenic 3.1 mile 25 minute ride to the ski terrain. Silver’s skiing is between 4,100 and 6,300′ elevation, on 4 unique aspects of Kellogg Peak and Wardner Peak. Silver is all about minimal lift lines, served by modest fixed grip doubles and triples. Its Idaho – so no big crowds at Silver. Silver Mountain will be open daily this witner, in the past it was just a Thursday – Monday and holidays operation. With 300 inches of snow annually, there is usually plenty of untracked powder. Silver has 77 named runs – authentic interesting trails like Bootlegger, Prospector, Centennial and Eureka with 100s of acres of glades stashed between, and soft natural snow on Steep and Deep, Quicksilver and Moonshine. Snowboarders and free skiers gravitate to the beefy terrain park on Quicksilver, where Silver pumps out the music 80’s style. Moms like me love the long beautiful runs of Ridge and Silver Bell. For Silver backcountry skiing, Wardner Peak has 16 chutes and bowls, named simply 1-16, and the wide open meadows reached b a little traverse/hike – untouched by groomers, left au natural. Silver also offers snow tubing below the Gondola Haus. Silver’s humble Mountain Haus Lodge at the top of the gondola has a cafeteria on the main level and a fun friendly ski bar upstairs, Moguls. Ask for the daily special which could be tacos, or jello shots. At the end of you ski day you descend the gondola with views of Silver Valley towards Coeur D’Alene, a relaxing way to reflect on your day at Silver’s slopes. 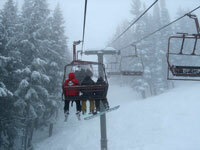 Families visiting Silver Mountain should lodge at Silver Mountain Resort’s Gondola Village in the Morning Star Lodge. You are steps to the Gondola in the morning for first lift off to the slopes, and you walk to Noah’s Canteen for après ski and pub fare, or the family friendly pizza joint. The Suites in the Morning Eagle Lodge are beautiful, Rocky Mountain decor with modern conveniences, like a kitchen and washer dryer in the unit, and ski lockers downstairs via an elevator. The rooftop hot tub is a treat with a view of the slopes and gondola which runs till 5pm. Kids will love après ski in the massive Silver Rapids Water Park, Idaho’s largest waterpark, with a Surf Flower Rider, waterslides, and a lazy river, and two Tiki bars for parents that need to whet their après ski appetite. Nearby snowmobiling excursions in the Idaho Panhandle National Forest is a great add on to your Idaho ski trip, for fun sledding and incredible scenery. Another afternoon, visit the funky historic town of Wallace to see the wild west architecture and stop in at one of the out-of-the-archive diners like the Red Light Garage or antique stores with bears, sheep and guns – so Idaho! The kids can stand on the center of the universe too – in front of the Wells Fargo Bank. Silver Mountain was originally called Jackass Ski Bowl when it opened in January 1968 on Wardner Peak. To tribute the town’s silver mining heritage, from boom to bust to boom again but as a ski town, the ski area was named Silverhorn in 1973 and finally Silver in 1990 when the gondola from Kellogg debuted (North America’s longest gondola)with a Kellogg Peak ski expansion. Silver Mountain Idaho is more affordable than say Sun Valley with ski and stay and splash packages (including water park passes). 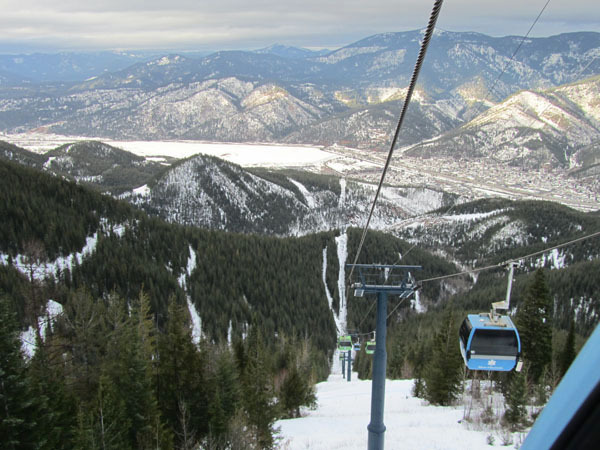 You can include Silver in a ski vacation to northern Idaho’s Schweitzer Mountain Resort, with a stop at Lookout Pass on the Idaho Montana border, and even Whitefish Montana. Go ski some beautiful un-crowded snow in Idaho! Hi ho Silver.